Dunskiag is situated in the stunning Upper Tay Valley, nestled just in front of the forest tree line with uninterupted views north, west and east. Highland Perthshire combines the lush low ground of the valley bottom with the rugged grandeur of some of Scotlands highest mountains. 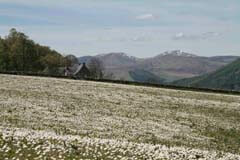 Due to the topography of the valley there is no better spot (we think!) from which to enjoy all that Highland Perthshire has to offer than Dunskiag. You can sit out on the patio and enjoy both the morning and evening sun. the great views towards the River Tay; the mountains of Glen Lyon and Ben Lawyers to the west; and Farrogan Hill to the north. Directly across the valley from Dunskiag is the historic Castle Menzies. 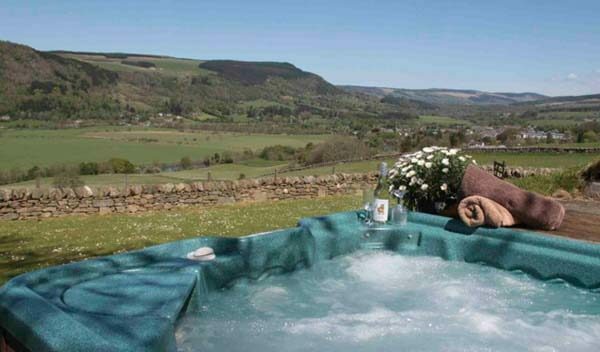 The cottage has a superb outdoor hot tub which is a great place from which to admire the landscape! There are so many things to do in the local area that it is difficult to know where to begin. There is something for everyone (and their children & grandparents!!). For those who wish to be active there is rafting, canoeing, saling, windsurfing, quad biking, paint-balling, laser-balling, jet skiing, kayaking, canyoning, pony trecking, ropes courses, golf, tennis, putting, hill walking, Munro bagging, low level walks, 4x4 off road driving, fishing, mountain biking, 4x4 mountain safaris and many more. Our local contacts and knowledge can help point you in the right direction. For those wishing to relax a little more we can point you to local art galleries, distilleries, shops and coffee shops; and in the evenings there is a good choice of local restaurants. The Birnam Institute and Pitlochry Festival both provide superb theatre and music options and the annual Enchanted Forest light and sound extravaganza brings to life the "Big Tree Country", as Highland Perthshire is known. We are happy to find out what programs are on in advance of your visit as many require to be booked well in advance. 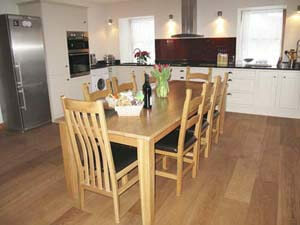 This is a superb Perthshire self-catering cottage and an idyllic place to stay for a relaxing (or active!) Scottish holiday. many nearby or directly from doorstep! 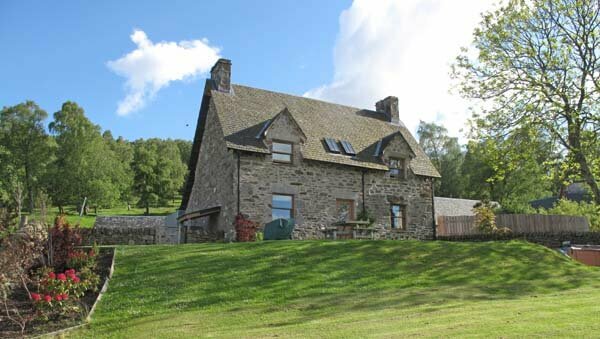 Dunskiag is a Grade-B listed traditional Scottish farmhouse that was fully rebuilt and renovated in 2003 to provide a high standard of modern accommodation internally, yet not compromising the original building. The unique scotch-slate roof has been completely restored and windows replaced with high quality solid oak sash-and-case glazing. The building is heated with underfloor heating throughout, powered by one of the first geothermal heating exchange units installed in Scotland, taking heat from 360 feet below the ground to provide a very energy-efficient and environmentally friendly source of energy. 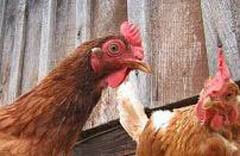 The neighbouring steadings are the home of the farmhouse owners. 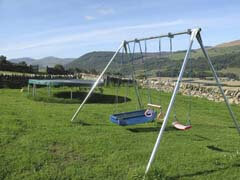 The next nearest house to Dunskiag is a good half a mile away, so the seclusion of the property is assured, yet it is a simple journey by bike or car of just a few minutes to the local town of Aberfeldy giving the ideal balance of seclusion but with the local town amenity of Aberfeldy. A sheltered front door leads into a vaulted entrance hall with storage for all your outdoor shoes and clothing. Off this is a convenient shower room with toilet, hand basin and shower. Also leading from the entrance hall is the open plan sitting room / dining / kitchen area, staircase to upstairs and a separate second livingroom area. The oak floored kitchen is well appointed with induction hob, Neff double oven, washing machine, dishwasher, microwave and all the other high standard equipment you would expect. A large 8x3' oak dining table with 8 oak dining chairs is in close proximity allowing for ideal holiday family meal times. 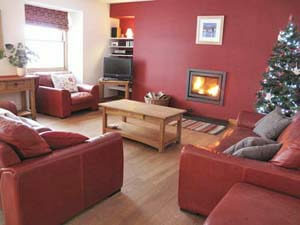 2 comfortable leather couches and single leather easy-chair sit around a charming modern wood burning stove. Sitting conveniently, but unobtrusively, in the lounge is a plasma screen TV with full Sky satellite package, DVD and music centre. The sitting room, kitchen and dining area have uninterrupted views across the valley towards the mountains and Castle Menzies. The second downstairs livingroom is a convenient bolt hole for adults or children alike and has comfortable seating, second TV, DVD player and games console. 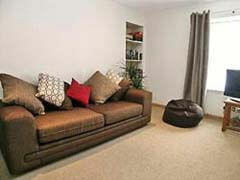 Wi-fi internet access is available from here or in all other areas of the property. Upstairs the second family bathroom has a bath with handheld shower, toilet and hand basin. 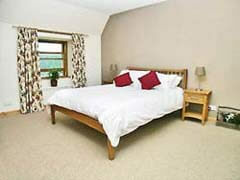 The 4 bedrooms are beautifully yet simply appointed, with lovely oak beds. Outside the property offers the most superb location for a holiday. It is completely enclosed by a stone-dyke wall so is ideal if you want to keep an eye on small children. The main outlook of the property is in the east-west directions along the valley. From its elevated position you can enjoy marvellous views in many directions observing with Glen Lyon and Ben Lawers mountains to the west; Strathtay valley to the east and the River Tay meandering along the valley floor itself. These views can be enjoyed sitting in the garden on the patio or good sized grassed area or if you prefer you can soak in the superb outdoor hot tub, perhaps enjoying a cold glass of wine whilst talking with your friends. A larger adjacent walled grassed area is also available for games such as football or rounders. Take the A9 from Perth to Ballinluig and take with care the A827 turn off for Aberfeldy. 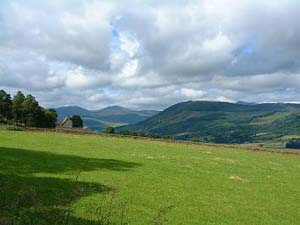 Follow the A827 up the Tay valley to Aberfeldy (10 miles), passing through the small village of Grandtully on the way. Continue through Aberfeldy to the traffic lights where you turn left. Continue 250m up this then turn right into Urlar Road. Travel 450m up to the last house on the right then take the right fork in the road and travel west 1.4km passing over a cattle grid and onto the track to Dunskiag. 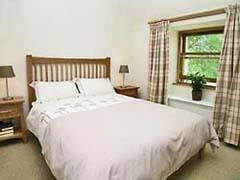 Central heating, electricity and hot water are included: also all bed linen and towels. Logs for the multi-fuel stove are also provided. There is a £20 supplement for a dog if you want to bring it inside - for those just using the outdoor kennels there is no charge. 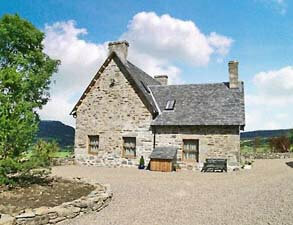 This luxury self-catering cottage near Aberfeldy is rented out year round. Change over day is Friday - arrive 4pm; depart 10am. 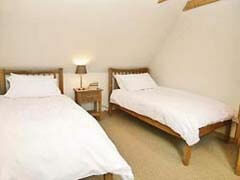 Short breaks are available - 4 night breaks (Mon-Thurs) or 3 night breaks Fri-Sun. To book this fabulous Perthshire self-catering cottage with a hot tub, click the enquiry button below and see prices and availability. 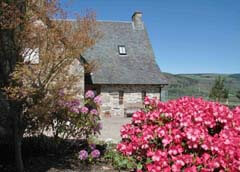 This delightful country cottage is beautifully appointed and has stunning views over highland Perthshire. There is so much to see and do in the area but if you want to relax at the house then the hot tub is a perfect place to do so!